October was a quiet month for myself and the blogging community. There were many book releases and announcements though! Along with great tv shows. Let's recap! + Cover reveal time! We have a beautiful cover for Finding Yvonne (Brandy Colbert). + Shatter Me fans - did you hear the news? You're getting another Shatter Me book! It's coming out March 2018. + Adam Silvera and Becky Albertalli are writing a YA book together ... AM I DREAMING?! + Dumplin' is getting a movie and (book) sequel. + And, finally, Cait's (Paper Fury) debut novel is coming out June 2018! Breeny @ Breeny's Books talks about her auto-buy authors. Danielle @ the chronicles of danielle gave us her favorite first sentences. Romie @ romie we deserve love shared her newest book haul! Coraline! I adore the movie (never read the book oops) and I knew I had to take advantage of my blue hair. So yeah! I love my costume, but hopefully, I won't freeze in it haha. October was a weak reading month. I watched new fall TV shows and I hit a minor reading slump. So, I'm behind on my reading goal but with a few graphic novels - I'll be on track. THE EMPTY GRAVE OH MY OH DEAR HOW WAS THAT???? Ooh, the Albertalli/Silvera book sounds cool. I like Albertalli but have never been able to get into Silvera, so it'll be interesting to see how well I like it. Your costume is so great! I dressed up as a Medieval princess and went trick-or-treating for the food pantry. TMG WAS VERY INTENSE. I can't believe its over. I'm so excited for Love, Simon. Oh my gosh that's so cool! I agree. I read Silvera's first book and I found it okay. Thank you! Your costume sounds awesome, Ellie. Have a great November. I'm so excited about the Albertalli + Silvera book! They've been talking about it on twitter and i'm so hyped !! Me too! Their book sounds sO good. Have a great November, Jolly! So many great books news this month!! I absolutely cannot wait for Becky and Adam’s new novel. 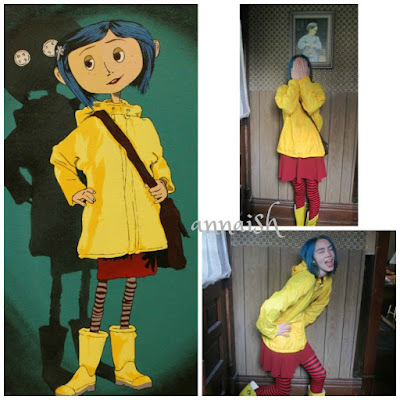 You look awesome as Coraline! Thanks for sharing my post, I hope you had a great Halloween! I know right?! I'm loving it. Same here! Thank you, Emily. No problem & you too! Yay cannot wait for Cait's book! You look great as Coraline and I honestly loveee your hair<3 Also is Turtles All The Way Down any good? I really want to read it but I feel like John's books are very much hit or miss for me. Me too! Thanks Lexie. :D I just finished Turtles All The Way Down, and I loved it! I found TATWD and its atmosphere different from his other books. I just started Genuine Fraud and so far, I’m really liking it. Also, I’m still SO impressed with your Coraline costume. It’s so on point. I wish it was socially acceptable to always go trick or treating, no matter your age. Happy belated Halloween! I can't remember my exact rating for Genuine Fraud... but I hope you enjoy it! Thank you so much, Erin. I worked really hard on it. :) Haha me too!